translation "The House of Leaping Waterfalls"
tropical flowers freshly cut from the eight acre plantation. as all types of cookware, dishes and cooking utensils. flowers, exotic fruit trees and much more. breathtaking mountain waterfalls and lush island forest. 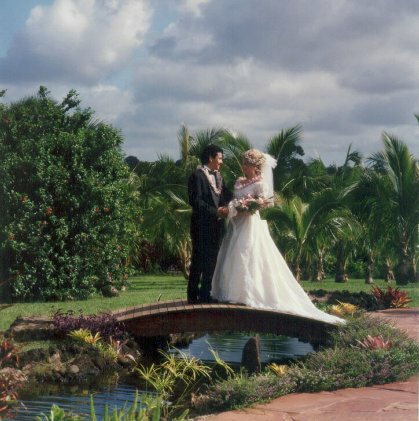 experience for both Honeymooners & Families alike. 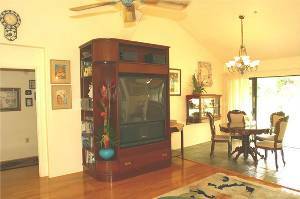 30 minutes from the Lihue airport. 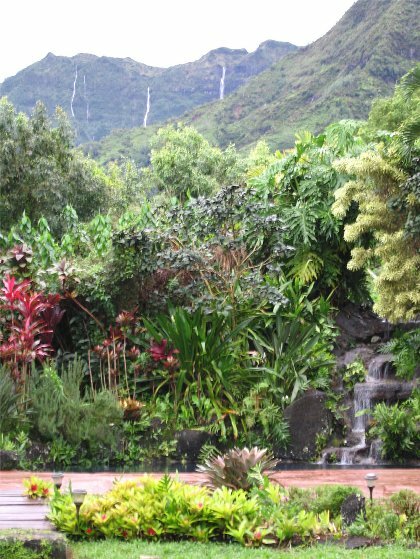 Coconut Beach Luau, Smiths Luau, Fern Grotto Boat Rides, Kaimokila Hawaiian Village,shopping, Wailua River, Sleeping Giant Mountain, Bell Stone State Park, Lydgate State Park & play ground, movie theaters, restaurants, botanical gardens, Waimea Canyon, Napali Coast. 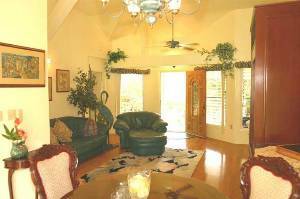 Our family of 5 were very comfortable in the beautifully furnished 3 bedroom tranquil oasis. The pool with working waterfall was enjoyable for all. Viewing waterfalls while soaking in the hot tub - superb. Kitchen is well equipped for cooking or bbq. On site washer/dryer were convenient. Snorkeling gear, beach towels and water shoes in a variety of sizes - just add your own plans. My Husband and I got married in the back yard on Aug 15th 2015 surrounded by our children and my Dad! We fell in love with the place. From the smells to all the amenities this house was perfect for our family 6. I dream about going back there. Tucked back in the hills you have 2 some days 4 1000 ft waterfalls in the back round as you relax in the pool that has its own personal waterfall. 15min to the closest beach. Our 7 year old son was in the water all day between the beach, pool and the jacuzzi. Perfect for family&#8217;s and honeymooners alike. You will not be disappointed. Do it! 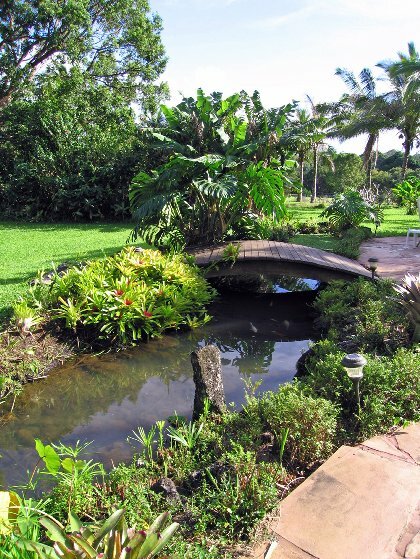 This lovely guest home surrounded by lush tropical fruit trees, bamboo, flowers and waterfalls! Yes, we spent a week here. In the spa, the pool, drinking fresh squeezed orange juice. The bedrooms are so comfortable with delightful mattresses. The kitchen is well stocked with dishes and cookware. We ate here every day. We used the BBQ twice. The laundry room was very helpful too. 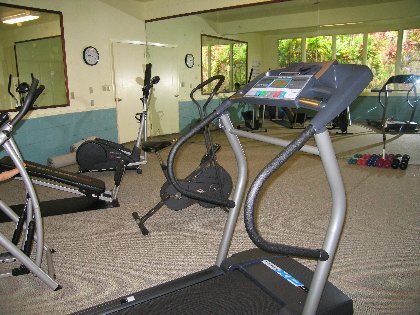 While the location is secluded, it is a short, easy drive into town. One surprising thing is the water. Fresh, delicious water from the faucet. No need to buy bottled water. Overall, we did not want to leave. 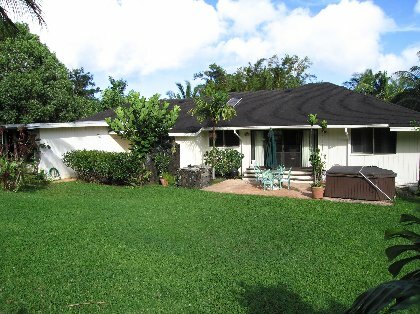 Easy to book, all questions answered quickly, and all the Hawaiian history around you in the house was so relaxing. Awesome location w/ tropical surroundings.You can view the waterfalls in the mountains just behind the house.We used the hot tub in the evenings to relax & view the hundreds of stars.The house is fully furnished & equipped w/ everything you need.Beds are very comfortable.Beach is about 15 mins away.There are even beach towels,beach chairs,snorkel equipment,boogie boards & more.Pool is gorgeous w/ a water fall. Will definitely be back.We were a group of 6, 62- 65 yr olds & had a wonderful stay. Had great time staying at Hale O'Wailele. Owners parents live right up the street and checked on us frequently to make sure everything was ok. Never far away from Kauai adventures at the house. Grand kids loved the pool with the waterfall. Had great time. Definitely recommend. Like others we fell in love with Hale O' Wailele the minute we walked in the door. We went in March 2005 and decided to go back again in March of 2007 because it was everything we wanted in a vacation. There are so many things about it to love like having the mountains and flower plantation in your back yard and sometimes with an occational rainbow. There's also the pool and hot tubs. There's no hustle and bustle of all the tourists when you get back to the house and it has all the ammenities you could ask for. So relaxing. Even though we've been there twice I know we will be back again. 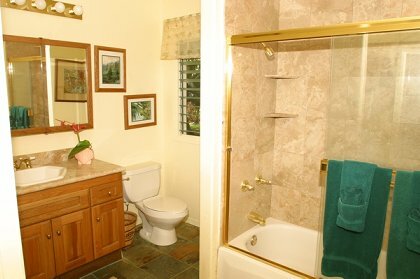 For Honeymooners or couples traveling alone the home may be rented as a Master Suite cottage for $300 per night. Cleaning Fee: $150 * Families or up to 6 adults the Entire 3 bdrm. / 2 bth. house is the ideal retreat for $400 per night. Cleaning Fee: $200 * Rates are subject to a 13.42% combined excise & state room taxes. * Weekly Rate: Book the home for 7 nights and get 1 night FREE! Deposit: * A deposit of one half of your total reserved visit is required to confirm your reservation. The remaining balance is due upon arrival. Cancellations and Refunds: * Deposit is refundable with a minimum of 8 weeks notice prior to reservation date, minus a $35 dollar processing fee.